The Billionty-Oneth Geek: Love Feast 2009!!! 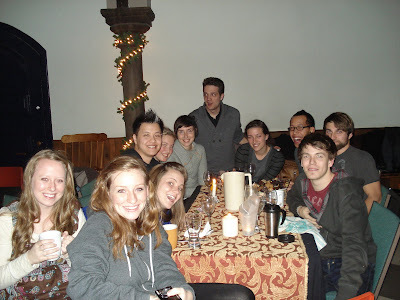 On Tuesday night, FreeChurch Toronto had a Love Feast to celebrate love as God had intended. Basically it was a big feast to the church members as well as the community at large. The place was packed to the brim with nary an empty seat in sight. Our new Living Room (small group) was officially inducted this past weekend after completing the 8-week long membership series. As the new members, our group was charged with the task of being the hands on help for the day. Our crew of folks did everything from helping with the cooking, decorating the place, serving dishes and then cleaning the whole place up. I think most of us ended up doing a little bit of everything. It was actual an excellent opportunity to further bond with each other as well as with the existing church members. What was awesome was the number of people that just walked off the streets, came in and had a meal with us. We were blessed to have them eat with us. I did feel bad about one thing though. There was this group of elderly Chinese people that came in together and I saw it as an opportunity to try and connect with them. I served them some dish and tried talking to them with my Cantonese speaking powers. But alas, it was to no avail... they were Mandarin speakers. They nodded and smiled, maybe they were happy that I tried, I don't know. I wanted to bridge that connection but I couldn't because of the language barrier. It was too bad. I can only hope that next time there would be some Cantonese speakers and I could talk to them. Balcony view of the festivities below. After the clean up and everything, it was after midnight and I just couldn't believe it. Our group was there for about 7-8 hours, but it went by so fast. We group hugged for a night well spent and I'm pretty sure we all left feeling elated. It was an awesome day. Later geeks! Most, but not all of our new Living Room members. These guys are awesome!